Domestic and foreign researchers and managers in archaeology gathered in the Central Highlands province of Gia Lai on October 31 to seek ways to promote the value of the archaeological studies of the Paleolithic age. The event, organised by the Vietnam Academy of Social Sciences and the Gia Lai People’s Committee, drew the participation of 120 experts from Cambodia, Laos, Thailand, the Philippines, Japan, China, the Republic of Korea, the US, Russia, Italy and Vietnam. Participants attached the significance of the detection, excavation and study of the complex of relics dating back to the early stone age in An Khe town in the province to the cultural values in the Southeast Asia and the world. The findings are considered material to national history compilation, and objects to be displayed at museums, towards making An Khe area an international and national hub of historic culture, thus contributing to the socio-economic development in the province and the Central Highlands region. Over the past two years, nearly 30 archaeological relics have been founded at Go Da and Roc Tung sites, including those from the Paleolithic period. 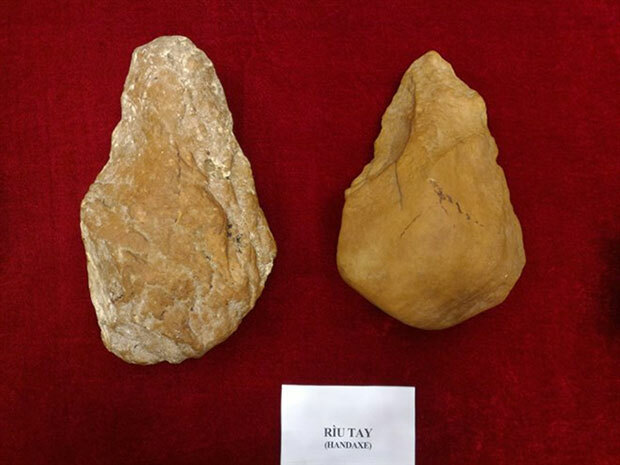 Artifacts such as stone axes, tectite pieces were unearthed at the relics. Director of the Vietnam Institute of Archaeology Nguyen Giang Hai said the Vietnam Academy of Social Sciences and the Russia Academy of Sciences have agreed to continue joining hands in excavating and studying the Paleolithic relics in An Khe Town from 2015 – 2019. The preliminary results of the archaeological study in An Khe town have recorded the presence of Homo erectus, an ancestor to modern humans, in Vietnam./.